R2-DB may not be a real astromech droid, but he’s going to help you navigate your way through Star Wars™: The Old Republic™! Ask A Jedi had an exclusive opportunity to sit down with R2-DB.com site founder and lead development director Aaron Cox to talk about this great new resource for fans of everyone’s favorite upcoming MMORPG! 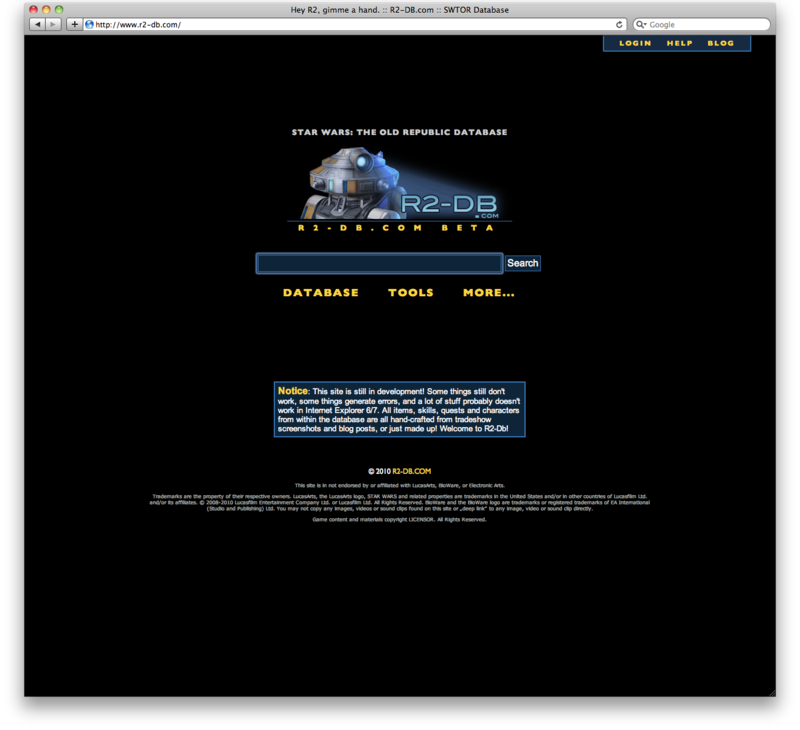 Ask A Jedi: Would you mind giving our readers a little bit of background about yourself and your role in the R2-DB.com site? Aaron Cox: Sure thing, my name is Aaron and I am one of the developers on the R2-DB.com project. 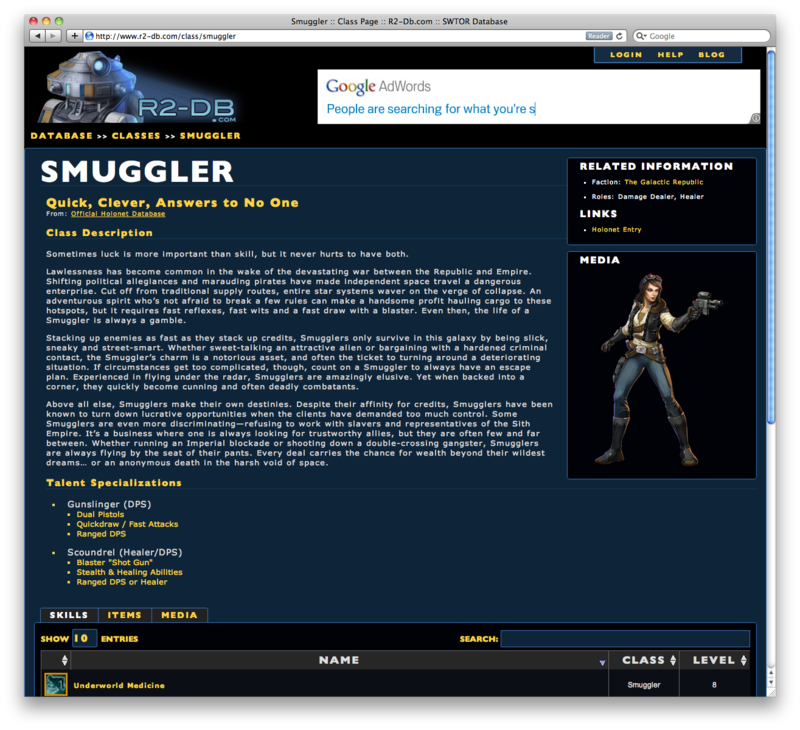 On the site, you will see me listed as “Jesta”, it’s been my name in MMOs since Ultima Online. I work with a small team of developers in my free time on sites like this, subjects we feel passionate about. We have a deep love for video games and a love for Star Wars, so we figured what a great project to embark on. We are also the team responsible for EpicAdvice.com, a World of Warcraft Q&A site, as well as a few other sites in development. 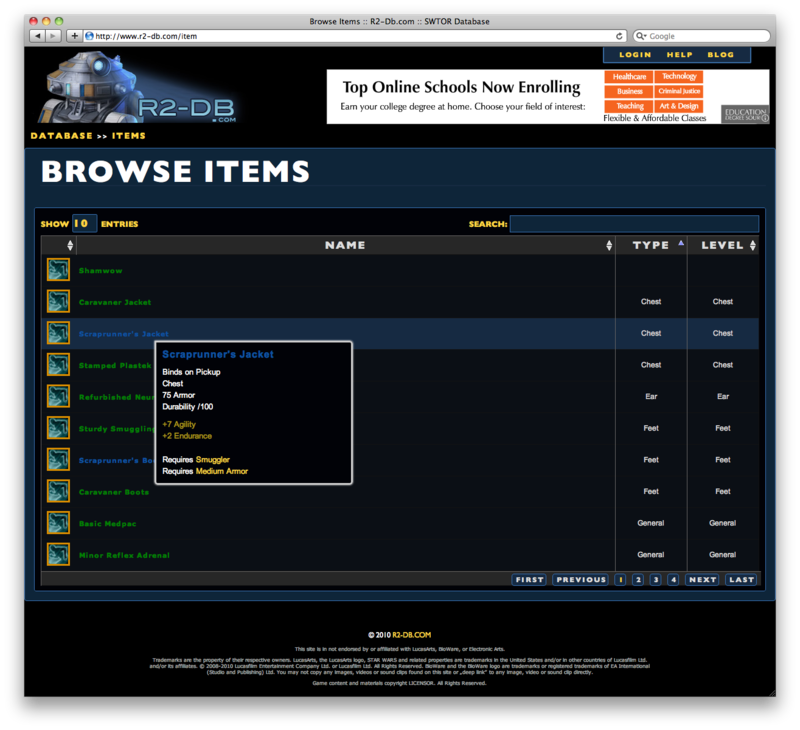 AAJ: So, for those readers who may be unfamiliar with what an MMO database site is and how it’s utilized, can you give us a quick overview? AC: An MMO “database site” is a site dedicated to the factual and statistical information about a game. 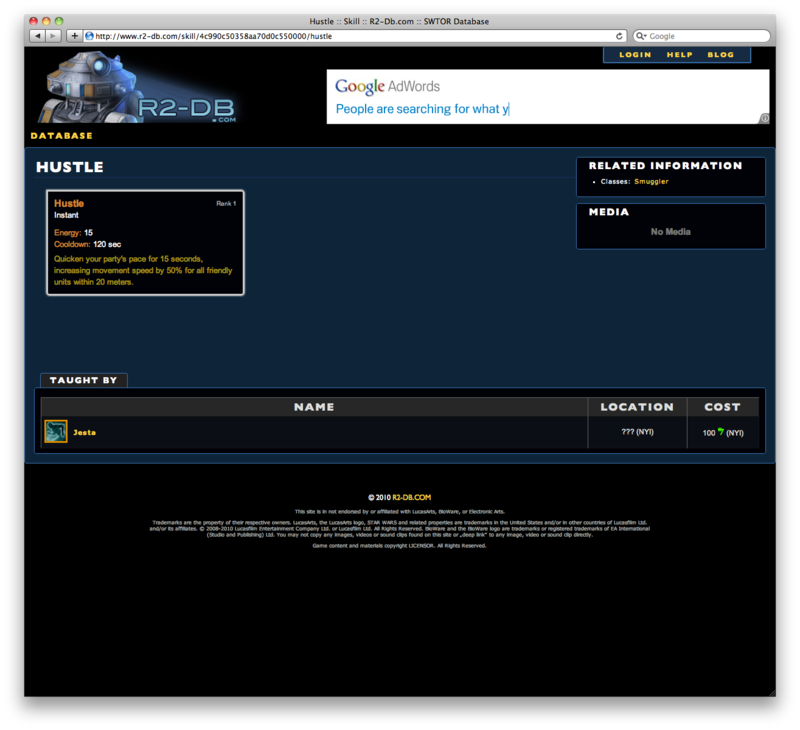 The goal of the site is to provide information about what you are doing in game as easily and quickly as possible. For example, we want to help you find that item you’ve been looking for, figure out your perfect talent build, or just provide a place for research on your abilities. All you have to do is search the database, and we will take care of the rest. On the other hand, it also serves as a social platform, allowing users to share information specific to the topics within the database. 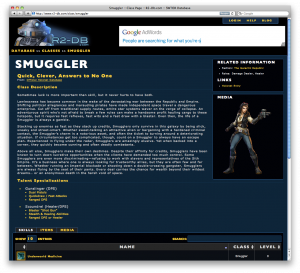 AAJ: How did the idea to do a Star Wars: The Old Republic database site come about? And tell us about the great name! AC: Well, I personally have been pushing this project hard, primarily because I am so incredibly excited about the game, but also because I’ve always wanted to do a site like this. Our team has a lot of “brainstorming” sessions where we just throw out ideas, elaborate on them and figure out “how can we do this better”. This was one of those ideas that ended up being talked about for hours and development quickly followed! The name R2-DB was also part of these brainstorming sessions. We all love it and think it has a great “Star Wars” corny-ness to it! The logo is not finalized, but we definitely want to follow the “droid” theme. We want a cartoon-y droid like R2-D2 to be our mascot, and your guide, through the Star Wars™: The Old Republic™ experience. AAJ: How will R2-DB differ from existing MMO database sites? Are there special features that don’t exist elsewhere? AC: During our initial launch, we won’t be too distinct from some of the other MMO database sites. I will honestly say wowhead.com has been an inspiration to us for its clear, precise and speedy presentation of information. We do however, want to do things slightly different from their model, and of course, better! We have some surprises up our sleeves that we aren’t ready to talk about yet, just because we’d rather keep quiet and make sure its possible rather than not deliver our promises. But what I can tell you is we are planning on working extremely close with the TOR Community that already exists. We want to serve as a “hub” of information instead of the only source. Also for other developers out there, we plan on creating an incredibly robust API to our database, allowing other users to develop and create new tools for the community. It’s a ways down in priority, as we want our things to work first, but we want to make the information usable everywhere. AAJ: Will you eventually offer a client program similar to other database sites, to allow players to help populate R2-DB with the latest game information? AC: It really depends. We have plans to develop whatever is necessary to help collect information for the database. If that’s a client program, then we will go that route, but if we can make it so you can do it via a web browser, even better. AAJ: Some database sites offer additional functionality, such as talent calculators, item comparisons and more. Are these in the plans for R2-DB? AC: We have a talent calculator engine already completed, we just haven’t published it because we have no idea what the talents are! We do however plan on offering full, save-able talent builds that you can share with your friends and readers. We also will offer a full range of comparison tools to help you figure out the differences between whatever kind of record your looking at. AAJ: What community features, such as forums, social network integration and comments, will the site include? AC: As of right now, we have none. The first feature coming to the table will be the comment engine allowing users to comment on anything in the database. I am not sure we will tackle the forums or any deep social networking, as we’d rather focus on what we do and do it perfectly. I’m sure I’ll be able to talk a little more in the coming months about some of the other “Social Features” we have planned. AAJ: You are soft-launching this weekend. Do you anticipate the official launch to coincide with the launch of TOR when released in the Spring? AC: Our plan is to have the site fully functional by the official launch, or shortly after, but that hangs on a lot of different factors. We need to find a method to effectively gather information about the game, parse it into our database and then link everything together. The “database” itself is completed, though we have a lot of “touch-up” work still to complete, which is why we are starting our Beta this early. AAJ: Thanks for your time today! Any final words for Ask A Jedi readers? So what do you all think? After speaking with Aaron, we’re very impressed with what we see so far and the plans for the future. Let us know your thoughts in the comments below! Great interview — very excited about this site! I was wondering when we would see something like this! This is awesome… makes me want the game even more now… just thinking about browsing through all the items, places, locations…. !!!! mmmmmm!!! The only problem with DB sites is gaining popularity, a lot of people want to be THE site. With all of that competition it is hard to find a site that is progressing well and staying up to date. I would like to see a site like that with help from Curse or another big site, as they have server power to handle such a work load. 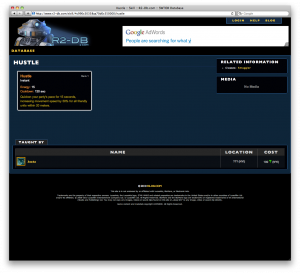 We’ve done a lot of hard work on the backend of R2-Db to make the site incredibly fast and scalable. We also are implementing new technologies (such as MongoDB instead of SQL) to decrease the workload on the server. Great scoop! There’ve been a few rumblings heard about future TOR dbs, but this one definitely looks and sounds the most complete! And yay for droid mascots!